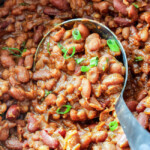 Add all of the Hawaiian Barbecue Baked Beans ingredients to your slow cooker and mix to combine. Cook on LOW for 7-9 hours or on HIGH for 3-4 hours, stirring occasionally. If the beans are too thick, stir in a little water, if not thick enough, continue to cook. Just before serving, stir in bacon. Top with desired garnishes. Enjoy!